The United States Postal Service is trying hard to sell itself to the public. They have been losing money at an alarming rate for many years now, and must do something. While their new TV ads seem to make their point well, whoever is in charge of the print campaign gets an "F" in cultural literacy. When I opened a magazine and saw this, my jaw dropped! All of my colleagues here at The Uncoveror were also aghast. I decided to contact them, as they have some explaining to do. I spoke to a man named Tim Smith at the Postmaster General's office in marketing and public relations. Here is a transcript of our brief conversation. Radstein: I like your TV ads about a corkboard never being hacked, and a stray mouse click never deleting a real letter. I also like receiving printed statements and receipts myself. That spot is really nice, but what is up with that print ad? Someone at the ad agency you hired must have been cracking a joke, but you took it seriously, and actually printed this? What were you thinking? Smith: I don't understand what you don't like about it. It is simple and to the point. Our services cost less than the competition, and aren't insecure like electronic communications. It really isn't any different than the TV spots. 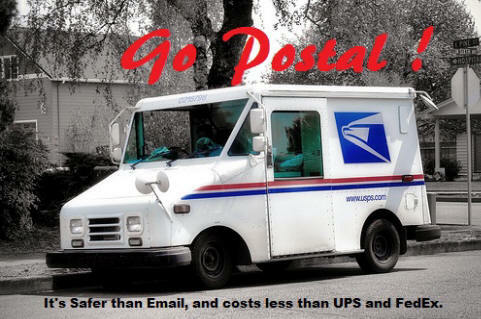 Radstein: The ad says, "Go Postal!" Do you really not know what that means? Smith: It means use the US Postal Service for your letter and shipping needs. What else could it mean? Radstein: Are you serious? You have never heard the expression "go postal", meaning to go on a murderous rampage at work? People say that all the time, and it came from incidents of workplace violence at the post office. Smith: Oh, come on now, Mr. Radstein! That's just silly. No one says that. We would be aware of it if they did. You must be making that up! At that point, I asked to speak to someone else. I was able to eventually talk to two more people in the marketing and public relations department, who also insisted that they were unaware of any negative connotation to this phrase. After that, they accused me of not being a reporter at all, but a "damn college kid" trying to prank them. They even went as far as to claim that they do not have workplace violence at the post office, and that all postal workers are happy in their jobs. The last one I spoke to hung up on me, and blocked my phone number so I can't reach them again. Where do they find such clueless people? It is no wonder that the USPS is going bankrupt.